Castias, Scamps, and the smaller Airstream models… I’ve often been caught staring at such travel trailers, lost in thoughts of welding on custom suspensions, fitting larger tires, and enjoying the weeks of in-camp luxury these cabins-on-wheels could provide to a basecamp deep in the wilderness. 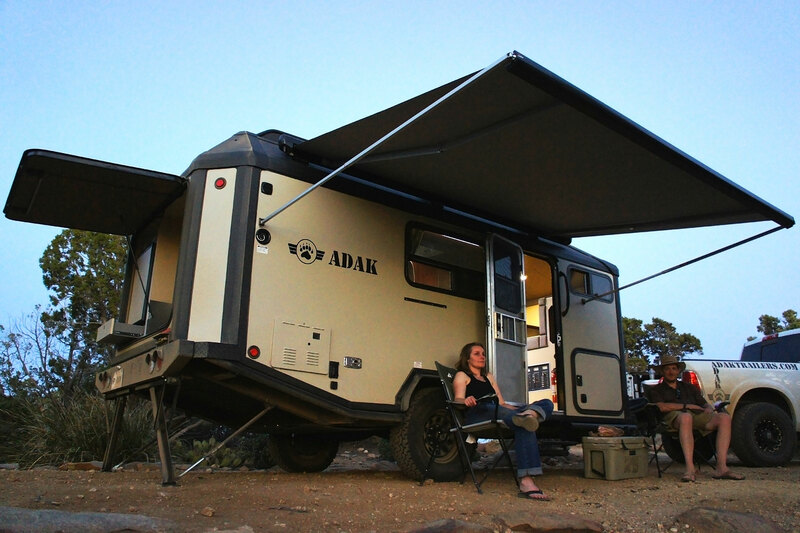 ADAK Adventure Trailers out of St. Augustine, Florida has made this dream a reality with their 116 square-foot Outpost. 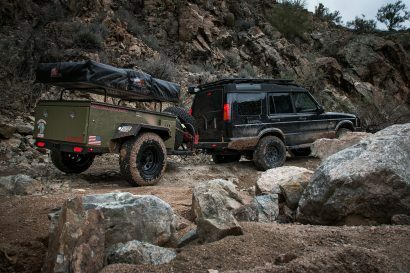 The Outpost isn’t going to be running many rock crawling trails—at 23’6″ long and 8’6″ wide it’s far from small—but with ample ground clearance and underbody protection it can handle most forestry access roads with ease, and is manageable on easy-to-moderate trails. 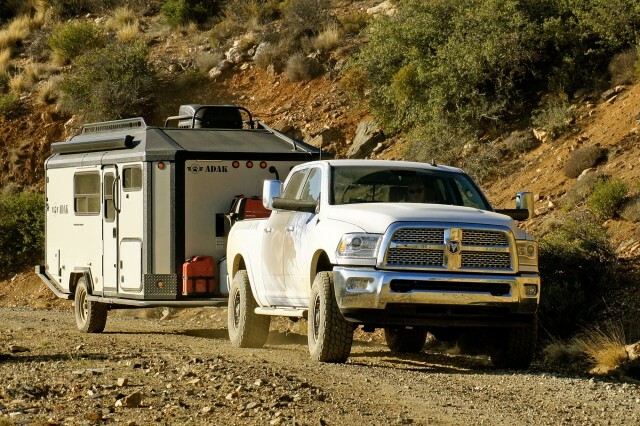 Dry weight comes in just shy of 5,000 pounds, so chances are you’ll be pulling this trailer with a full-size vehicle. 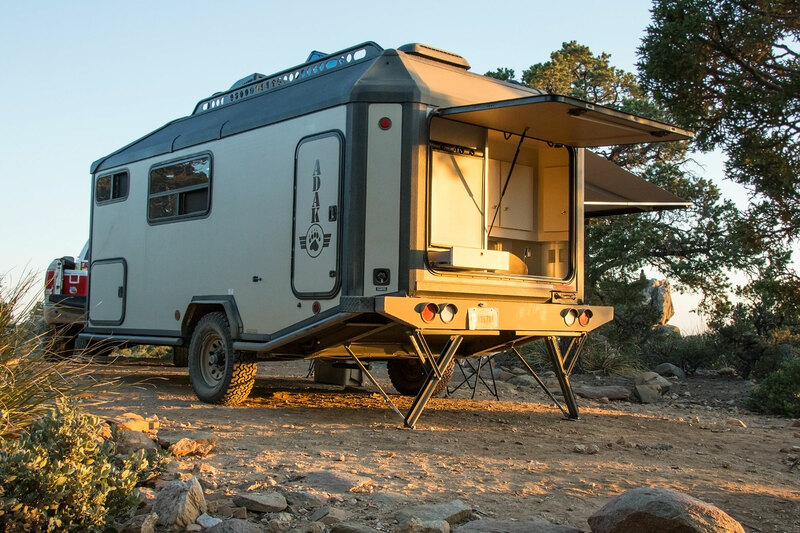 The armor continues over the roofline, with protective bars ensuring branches won’t strike the air conditioner and skylight on the roof of the tall trailer. 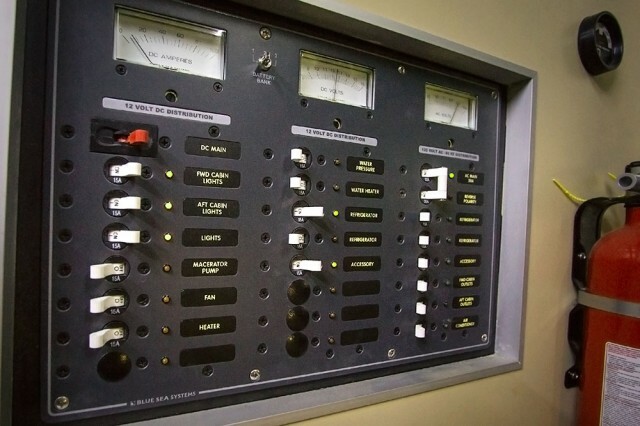 After arrival at camp all systems are conveniently placed and easy to access for setup. 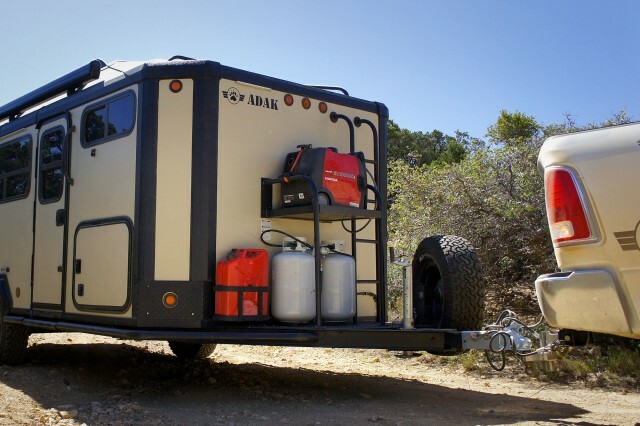 Storage for propane, a generator, and fuel is provided by a sturdy shelf at the nose of the trailer, along with a ladder for roof access. 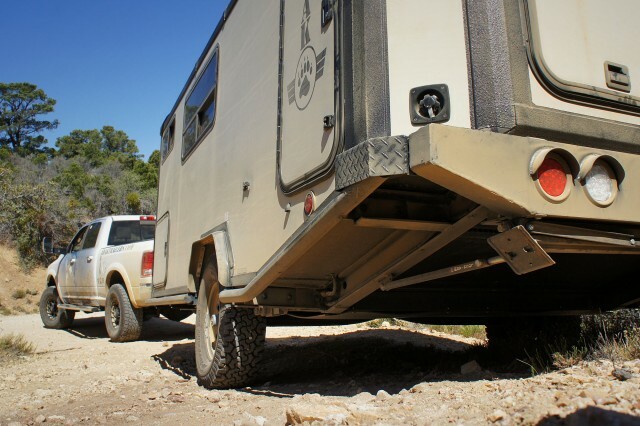 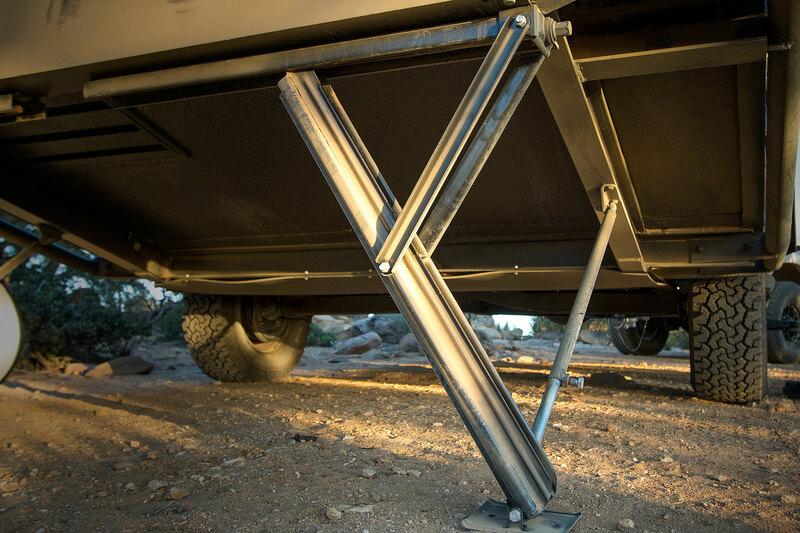 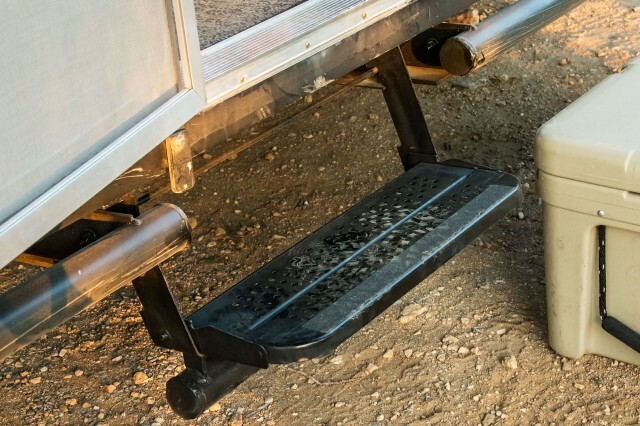 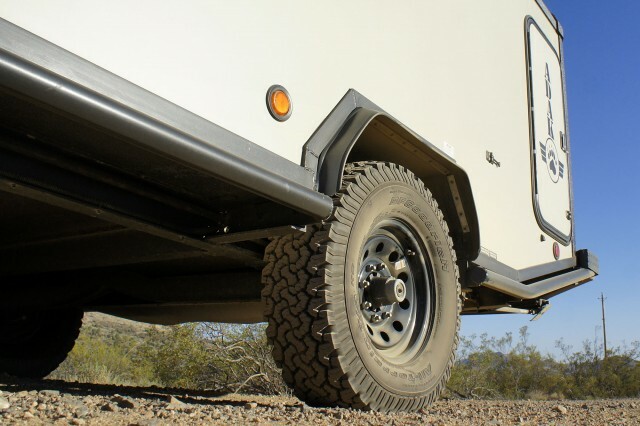 Tall stabilizer jacks in the rear help to level out the trailer on practically any terrain, and a section of rock rail underneath the door drops down to reveal a convenient step. 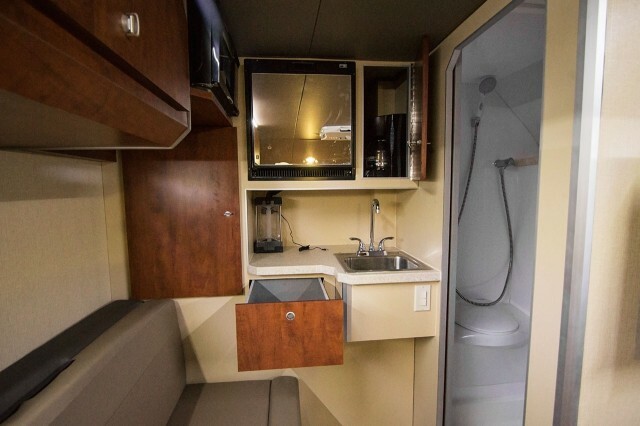 The teardrop-style exterior galley compartment opens up from the rear of the trailer, and it’s massive door becomes an ample awning to cover the work area (an interior galley floorplan is available as well). 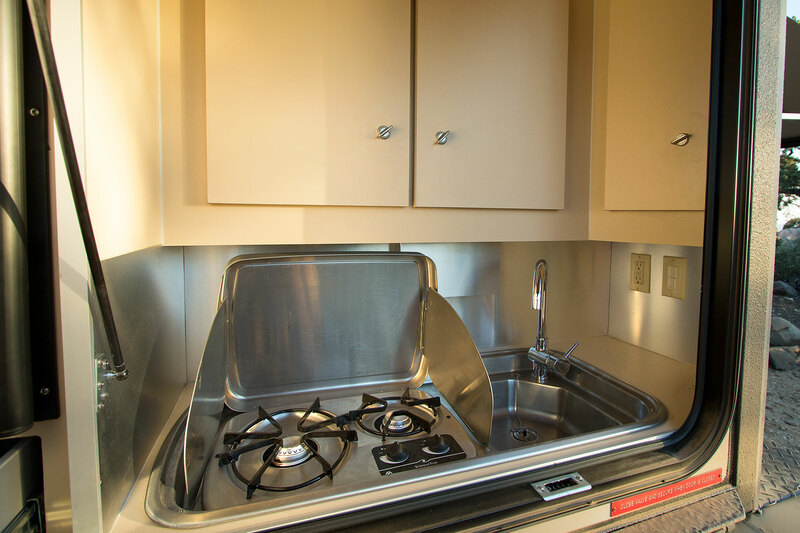 All of the essentials are present, including fridge, freezer, sink, stovetop, and enough storage for a fully kitted kitchen. Additional storage for tools, bbq, or outdoor gear is provided in compartments along the left side. 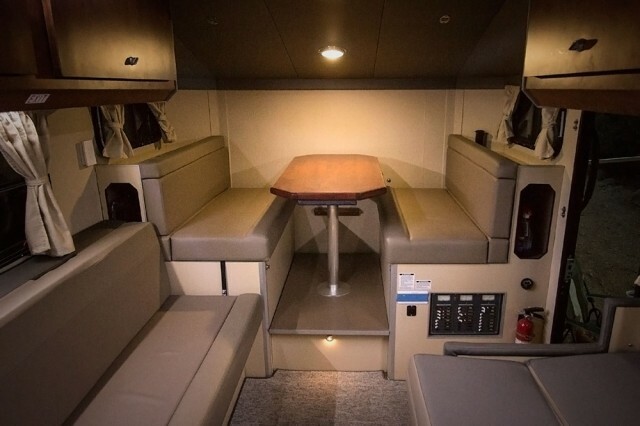 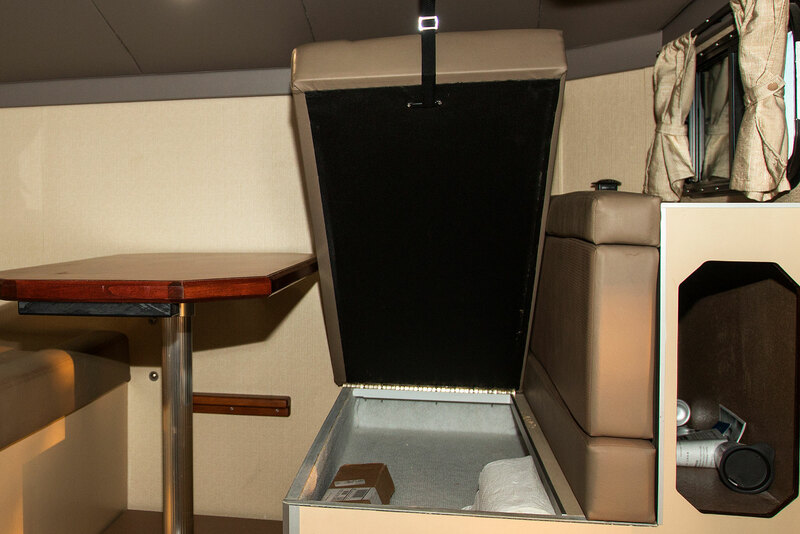 Moving inside the cabin reveals a posh interior that rivals an EarthRoamer for comfort, complete with full wetbath, ample storage compartments and closet space, oversized 4-person dinette and two large sofas—all with thickly padded leather seating. All seating surfaces transform into sleeping spaces, and bunkhouse floorplans are available if additional sleeping capacity is required. 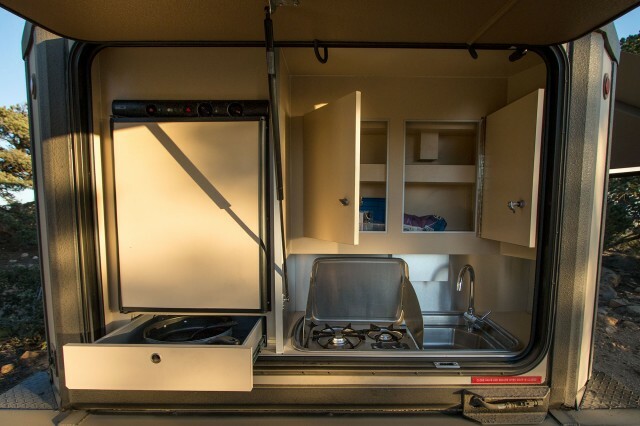 Headroom throughout the trailer is a generous 6’8″. On the exterior galley models a wetbar is available inside complete with sink, small fridge, and microwave. For survival in harsh climates a 13,000 BTU furnace and 13,500 BTU air conditioner maintain comfortable temperatures inside. 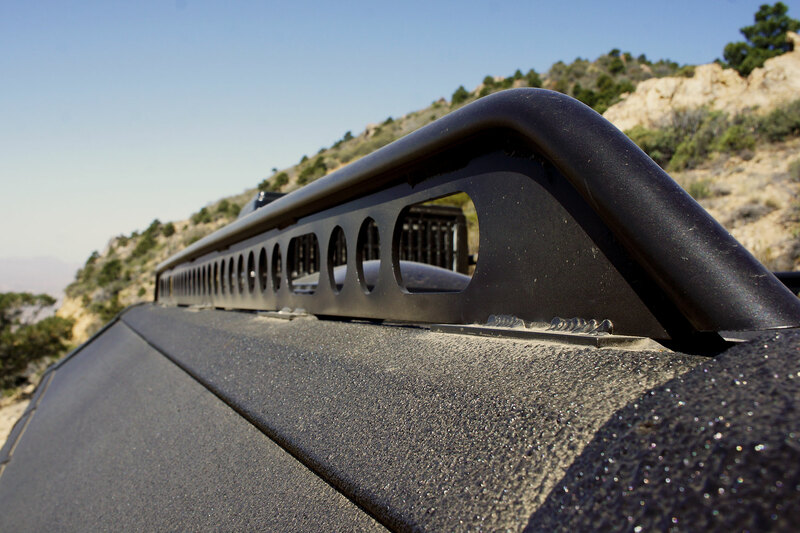 The freshwater supply carries 43 gallons, and an optional 4-seasons package is available for cold climates. 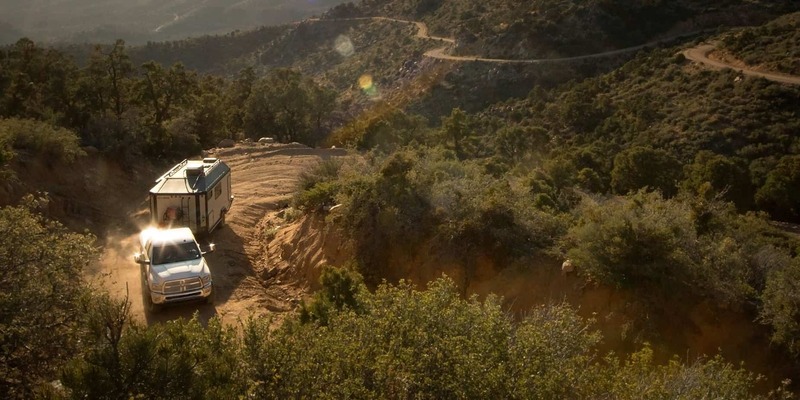 The base model Outpost starts around $55,000—pricing it well under a comparably equipped Airstream, but with far greater off-pavement capabilities, and floorplans and features can be custom-tailored to suit your specific needs. 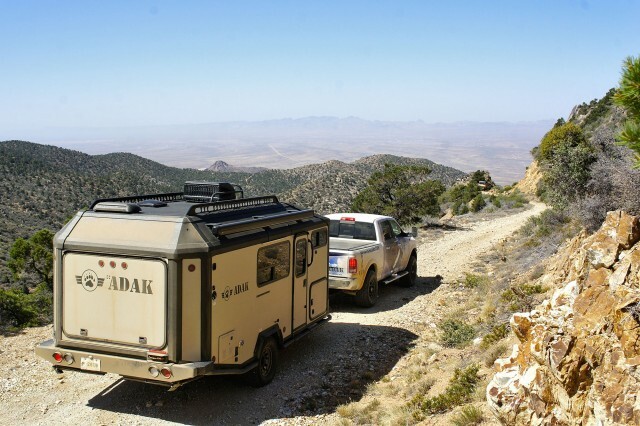 To learn more about ADAK’s line of trailers visit their website at adaktrailers.com. 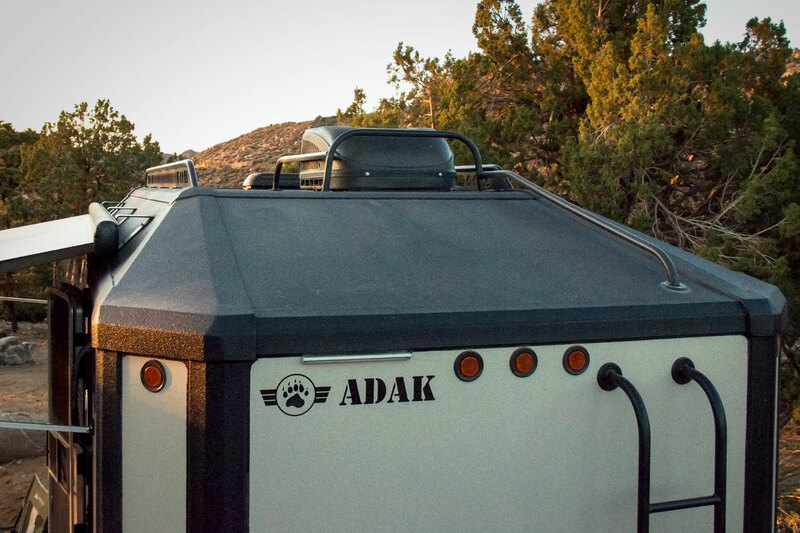 Editor’s note: Like the concept of the ADAK Outpost, but find it’s just too big or heavy? 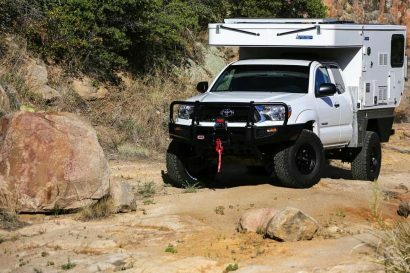 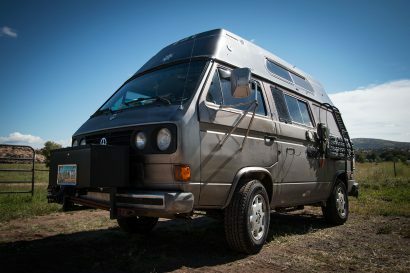 A 13-foot version is in the works which will weigh in well under 3,000 pounds, and it will be on display this year at Overland Expo East.